The overall scheme was to increase the number of lines into Bristol, from two to four. The works consisted of lots of detailed individual works within the vast overall project. 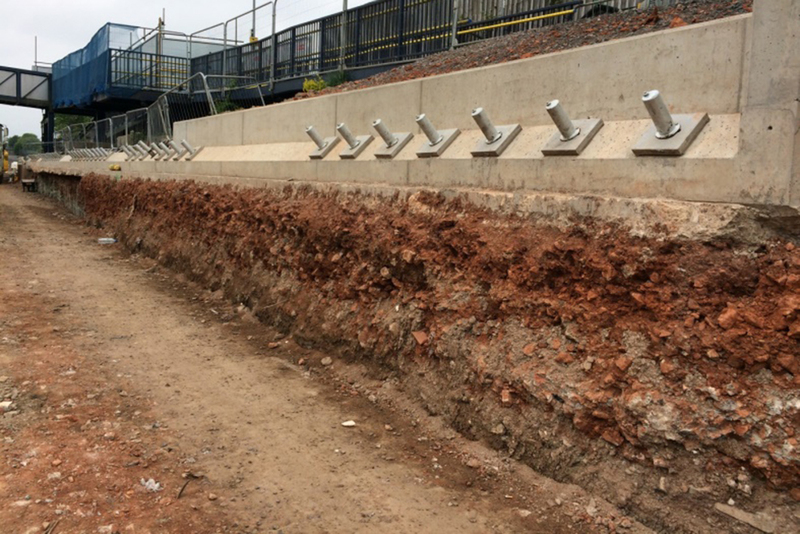 This retaining wall being one of several projects that CAN was involved with on the scheme. After the piling had been completed CAN was brought in to crop the piles forming a 33m long upper pile cap, along with a lower 8.9m cap. Working to the steel fixing design, the pile caps were cast leaving sleeves for installing soil nails through. 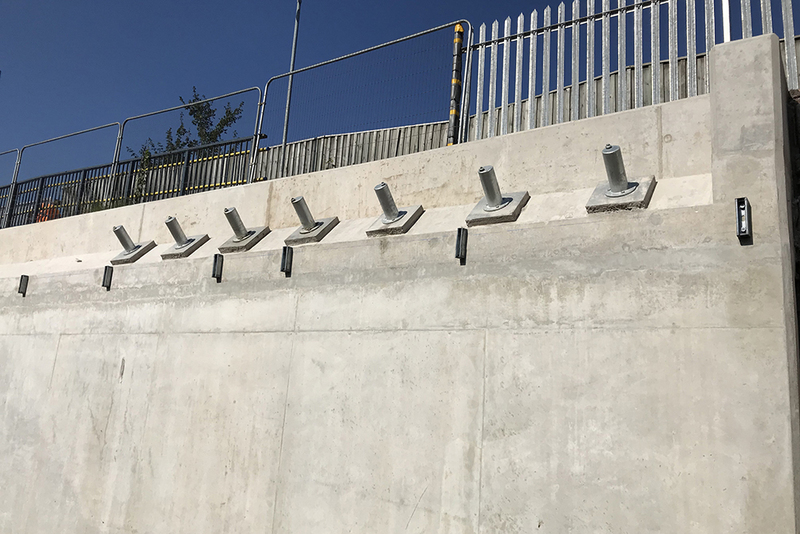 Once complete, CAN installed 20mm Dywidag DCP anchors through the sleeves and into the slope. These were 8 m long and totalled 39no in the upper pile cap and 5no in the lower pile cap. 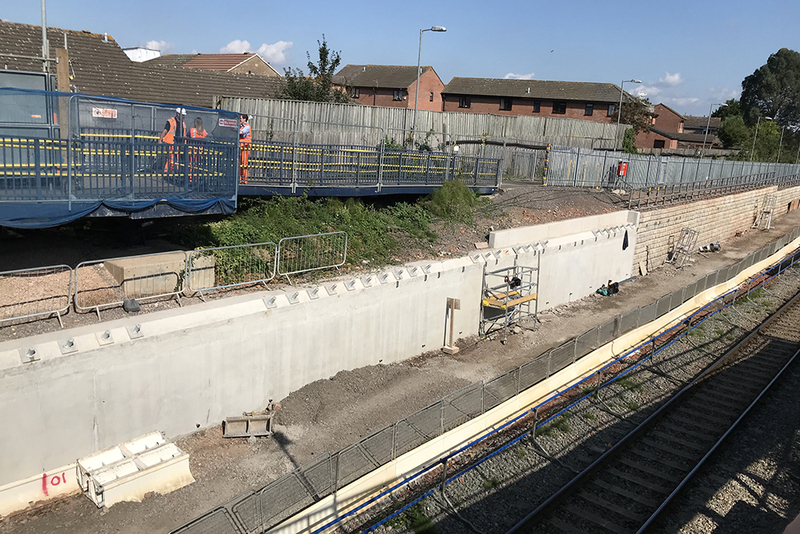 Once the anchors were installed, cured, tested and loaded, the ground forming the piling platform was excavated so that a reinforced concrete wall could be poured. The grout used around the anchor cured on its own. The testing was completed by CAN using our own testing kit and the test type was a pull test: load displacement test. Before the wall was poured, necessary steel work and drains were installed. ABG Piledrain was used and a solid pipe installed through the wall to create a weep hole. The formwork and reinforced concrete wall was installed in bays of approximately 12m. A working platform was attached to the formwork to protect against falls from height. 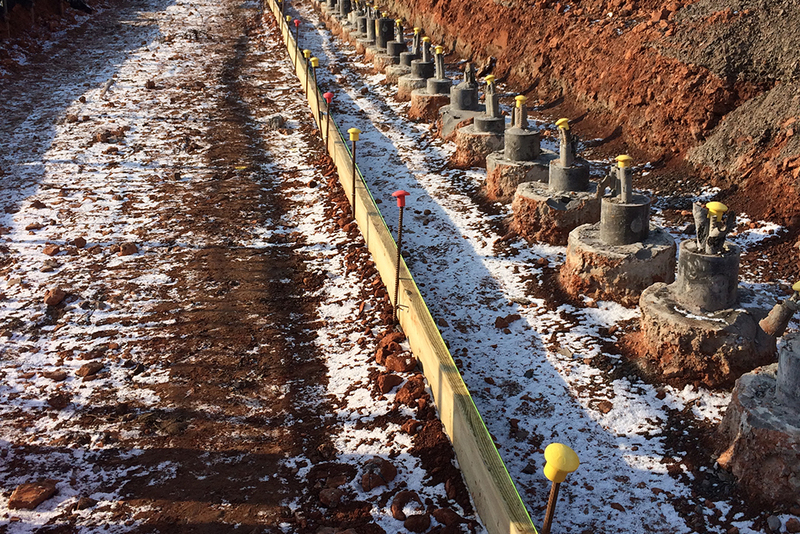 The pour was tackled using a mobile boom pump so that no heavy line pumps had to be manually handled around the site.